Power of a photo lab on your Mac. Is there a better alternative to Snapshot? Is Snapshot really the best app in Image Editing category? Will Snapshot work good on macOS 10.13.4? Snapshot brings the power of a photo lab to your computer. Printing your digital images has never been easier. You have full control over what size you want to print at and how you want to crop and frame your picture. Add borders and speech bubbles for more interesting and personal prints. Multiple layout styles allow you to get just the prints you want - and full print previews make wasted paper a thing of the past! Non Destructive Cropping - Print a cropped portion of your picture while leaving the original untouched. Version 2.1.1 is a bug-fix update that solves incompatibility problems that affected some Tiger customers when using specific printer families. It also addresses an issue whereby the wrong date was sometimes displayed on pictures imported from iPhoto. Border Styles - Add border styles to your pictures, making them more unique and interesting. Speech bubbles - Add some humor by adding speech or thought bubbles! Precise Print Sizes - Print pictures to exact sizes like 4x6, 8x10, or any other size you specify. It's never been so easy to print out pictures that will fit your frames. Borderless Printing - Take advantage of your printer's ability to print borderless photos for a professional look. 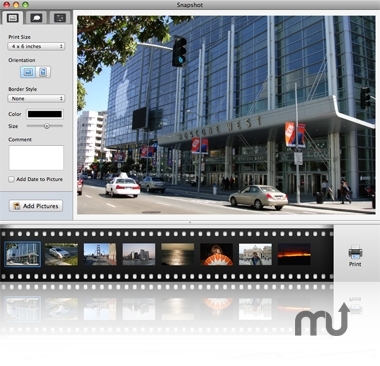 iPhoto Integration - Snapshot is fully integrated with iPhoto - easily browse your iPhoto Albums from within Snapshot. Save Paper - Snapshot can automatically fit as many pictures on a page as possible to save expensive photo paper. Or print using an alternate layout - even print contact sheets for an image overview. Preview - Use the print preview to see what the final print will look like. No more wasted paper. Print Any Image - Snapshot supports a wide variety of image formats.